MANILA, Jan 1 (PIA) –- The New Year, 2012, will definitely be a busy a year for road works as the Department of Public Works and Highways (DPWH) will soon embark on an extensive rehabilitation project. Public Works and Highways Secretary Rogelio L. Singson recently said that beginning Tuesday, January 3, the DPWH will start the rehabilitation of the Old Sales/Villamor Bridge to include the upgrading of Pasong Tamo/Lawton Avenue/Juliano Avenue. 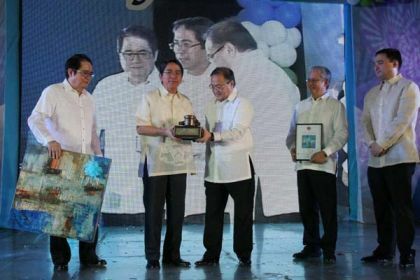 Singson said the department’s Urban Roads Project Office-Project Management Office (URPO-PMO) will work on the P60.38-million worth project that will improve the structural integrity of the said bridge. “Since Sales/Villamor Bridge was constructed in the early 70s, we need to rehabilitate it to cope with the current loading standards to resist seismic forces,” said Singson. He added that the project aims to improve the geometrical configuration of Sales Interchange Quadrant II ramp that will eventually improve the access and travel time at the intersection leading to the Ninoy Aquino International Airport Terminal III. Likewise, the project will also include the upgrading and widening of intersection at the Pasong Tamo/Lawton Avenue/Juliano Avenue and the loop configuration of the Rotunda and relocation of the weighbridge near Aeronautics School Gate in Villamor. Meanwhile, the DPWH chief also assured the public of more quality and safe roads this year.